Guitar Sing Along includes a professional guitarist, who performs popular kid’s party songs, as kids sing along. Guitar Sing Along parties may also include kid friendly musical instruments, for hands-on musical fun. Kids as well as adults enjoy musical games. 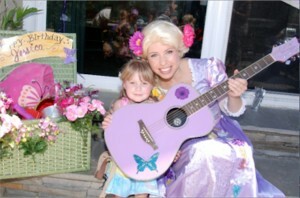 Guitar Sing Along parties are fun for all ages, and perfect for Kid’s Parties ages 3-7yrs. Available for Birthday Parties, Pre-School Playtime or any musical theme event. Choose to have a male or female guitarist. All of our performers are professional singers/song writers. Please call and speak with a live agent, for information and pricing.